When will IFFT, Alexa, and Google Assistant be supported? We will be supporting Alexa before the end of 2018! As for Google Assistant we are currently working on pushing that out as soon as possible. We'll keep ya'll updated here on the community board. I also would like the camera can record without having connection of internet, only when internet is working camera work. It can record without an internet connection, but you will not be able to access the video without an internet connection of some sort. What happened to Apple Home Kit? still in works? or dead? To add on to this. Maybe a solar panel or plug in solution that could offer live local streaming. 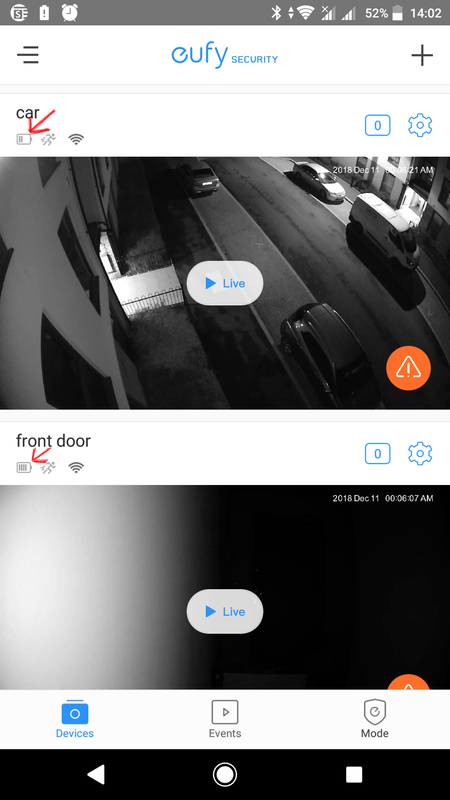 Again, ideally I would love to have the app running on an iPad in the house so I could just walk over to it and see what’s going on outside of the house. This was a huge advantage to my old system (blue iris). Just got mine and love it bit a couple of things I'd like to see - some easy maybe? Be able to change the sound notification on my Android phone to a specific one so i know when there's an alert. I can't tell whether it's an alert or email or 'default' sound. Home/away assist as per Nest in that it knows when your phone (and/or another family member) is at home/away and be able to switch off/on the alerts maybe coupled with a 'night' mode so that if you're at home it can automatically set the alerts when it's night? Not thought it through properly maybe but please add thoughts? It was said that the Eufy app includes Geofencing. I can’t see this anywhere. It is a hsssle to turn the camera on and off each time you leave and renter the house. When will this feature be added? The ability to add more (custom) modes would be great. I would love another mode for night time when we are sleeping. The camera that watches our vehicles I want to be able to sound the siren if it detects a person, or even better, only when it detects a stranger. May be able to be addressed with IFTTT. I would like to have a camera with a narrow field of view and also a pan/tilt zoom capable camera. Where can I order cameras or single parts from Germany ? Exposure adjustments please! Different ones for night and day modes. At night the areas of interest are just black, there are some bright features that the camera is exposing for instead. Have you made sure you have night vision turned on? Thanks for the feedback! Forwarded! We will be offering single cams/parts after the Kickstarter is over! This may already be present somewhere in the app and I just haven't found it yet, but a battery indicator per device would be very helpful. I realize the cameras should have a significant battery life, but it seems like a no-brainer to be able to understand how battery life is affected with different settings activated. I would love to see the thumbnail update with the last recorded motion event. This would give a quick view when you open the app of what is going on. For instance, I can open the app quickly and see that the mail man triggered the alert. Erm... of course I have! A rain shield please! At the moment my cameras just get rained on and then raindrops prevent me from viewing the image clearly. Even my cheapo IP outdoors IP cameras have the lens protected. We are still evaulating Home Kit, but we will most likely not have this as an addition. With that being said, Alexa and Google support will be avaliable before the end of 2019! You should be able to change your notification preferences in your Android settings! Thanks for the feedback! In terms of geofencing- we're looking to add this functionality in Jan. of 2019! +1 a cheap 'clip-on' rain shield sounds like something that could be created fairly easily for a company like Eufy (Anker).